Sometimes a technology that's been simmering in the laboratory or the clinic for decades makes the leap to mainstream consumption almost overnight. Take the cavity magnetron. The precursor to this curious form of vacuum tube was invented at General Electric around 1920. It wasn't until 1940 that British scientists found a magnetron design that could pump out microwave energy at unprecedented power. That discovery fueled a crash program at the Massachusetts Institute of Technology to build airborne radar units, an advance that helped the Allies turn back Nazi Germany in Europe. The conflict had barely ended when a Raytheon engineer noticed that microwaves could also melt chocolate. The “Radarange” debuted in 1947, and today there's a magnetron in virtually every kitchen. 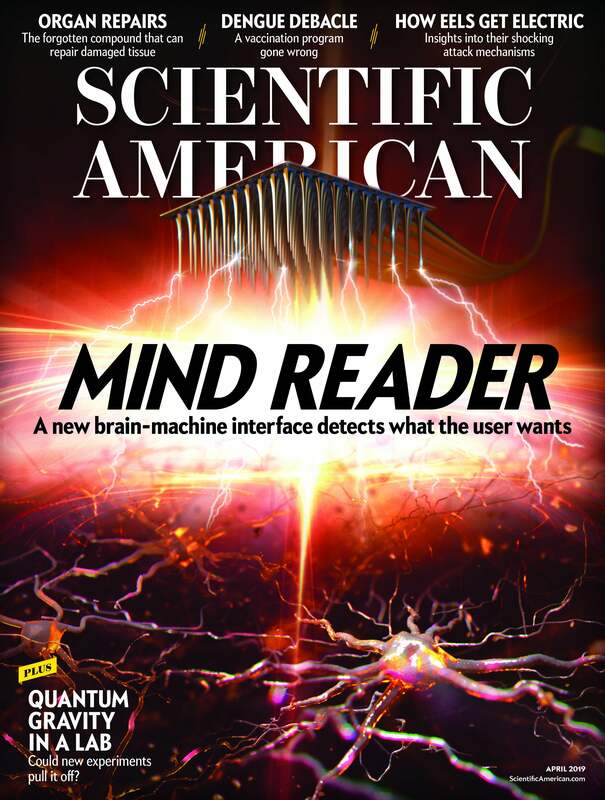 The next old-but-new technology to pervade our lives may be so-called neural interfaces. Thanks to noninvasive tools that have been around for decades, such as electroencephalography (EEG) and functional magnetic resonance imaging (fMRI), physicians and neuroscientists can measure changes in your brain without drilling a hole in your skull. And now some of the problems that made these tools finicky, expensive and hard to interpret are being ironed out, meaning that neural interfaces are suddenly showing up at Amazon and Target. Which presents a challenge because measuring brain activity isn't like making microwave popcorn. There are enormous privacy and ethical issues at stake. The story of Toronto-based InteraXon, a brain-machine interface start-up founded in 2007, shows how fast things are changing. Getting reliable brain-wave measurements via EEG used to mean pasting dozens of electrodes to a subject's scalp. But InteraXon built a wearable EEG device with just a few electrodes that rest against the forehead and behind the ears, along with software to classify the brain waves they measure. Low-frequency “alpha” waves indicate a relaxed state; higher-frequency “beta” or “gamma” waves indicate a busy or concentrating mind. But it's one thing to use EEG data to diagnose sleep disorders or epilepsy; it's quite another to start monitoring the brain states of millions of healthy consumers. So Garten also founded the Center for Responsible Brainwave Technologies, which aims to prevent privacy breaches, excessive scientific claims or other missteps that could derail the nascent neural-interfaces industry. “The goal is to create a set of standards to ensure that everybody's data is kept safe at all times and that the technology is used appropriately,” Garten says. Mary Lou Jepsen is onboard with that. She's a Silicon Valley hardware engineer who recently founded Openwater, a start-up building a ski-cap-shaped device that will use skull-penetrating infrared light to measure blood flow—a sign of which brain areas are working hardest. Jepsen conceived the technology as a low-cost substitute for fMRI for diagnosing brain injuries or neurodegenerative diseases. But one day, she says, it might also be used to read thoughts. As with so many other technologies, consumer neural interfaces seem destined to reach consumers before they're fully cooked. For now they'll be best served with a healthy side of caution. Wade Roush is the host and producer of Soonish, a podcast about technology, culture, curiosity and the future. He is a co-founder of the podcast collective Hub & Spoke and a freelance reporter for print, online and radio outlets, such as MIT Technology Review, Xconomy, WBUR and WHYY.